Breakdown: We're off to a good start here. Christopher Columbus has put down a time of 1:28.89 on Feb 3rd, which is already faster than five of the past years best marks, at the end of the season. The depth isn't bad either, as we're tracking for one of our fastest years ever. Interestingly, it seems as the State got faster when the State Record went down in 2015. It was also the fastest 10th place time (ie. strong State depth) of the sample set. Breakdown: Although we've been Nationally competitive the past two years, the top end talent has been the weakest since 2009. 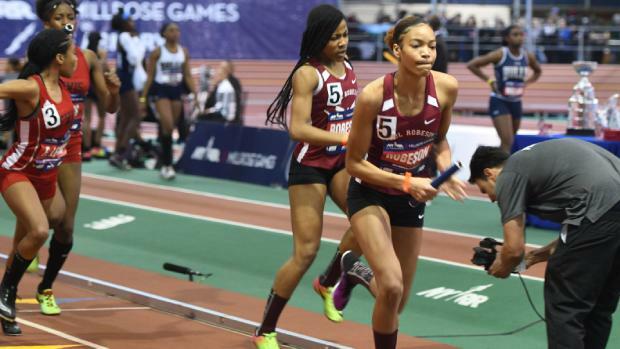 Paul Robeson was all set to challenge the 4x200m Record in 2016, before a DQ at Nationals (they made it up in the 4x400m), and with graduation, have been the team to beat ever since. Interestingly, the depth of the State (10th place time) has remained remarkably stable, although it's waiting for the State Meet bump in 2019. Update: Millrose was yesterday, and Paul Robeson ran to a US #2 in 1:37.91. That makes them NY #4 All-Time, with plenty of time left in the season to clear off some unfinished business with that State Record.